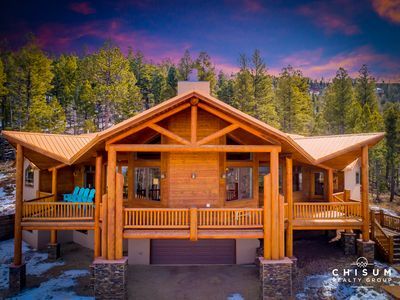 Located on an overlook above Angel Fire, NM is the “Allouette 9305” home; a perfect mountain retreat for an exceptional vacation with the family or a small group of friends. 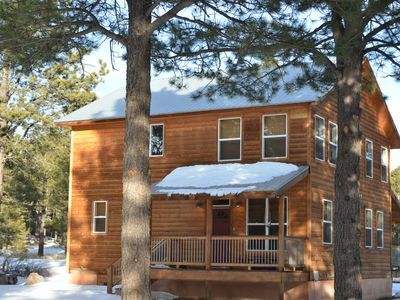 Allouette 9305 is a 2100 square foot, spacious 3 bedroom, 3½ bath home located just minutes from the town center and all of the activities that Angel Fire and the Enchanted Circle have to offer! The home comfortably sleeps 10 people on two levels. There is sleeping for a maximum of 6 adults with children filling in the balance to 10 total people. 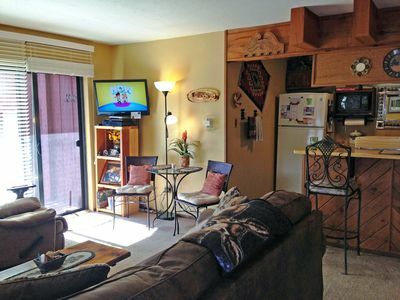 On the lower level is the master suite with a queen size bed, full bath, and walk-in closet. 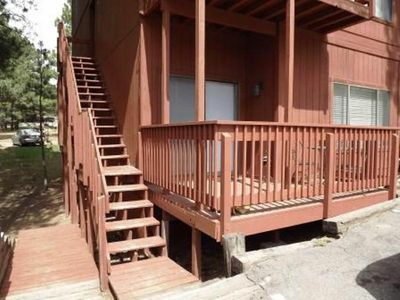 Upstairs there are two bedrooms; each bedroom has a queen bed, a twin bed, twin trundle bed and a full bathroom. Each upstairs bedroom sleeps four (two adults and two children). The 1300 square foot wrap around deck will quickly become the center of activities at the house. 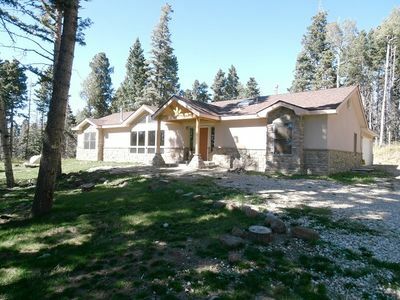 There is a 6-person hot tub on the deck with great views of the southern Moreno Valley. 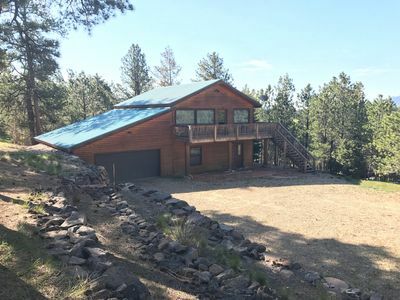 In the summer and fall, watch the morning sunrise with a cup of coffee and newspaper on the southeast side of deck with an expansive view of the Cimarron Range of the Sangre de Cristo mountains. Following a busy day of outdoor activities, enjoy a late dinner amongst the lightly wooded west side of the deck with glimpses of the Moreno Valley. After dark, lay back and relax on the deck while looking up at the heavens watching for shooting stars or passing satellites! I cannot describe how truly amazing the sky is when there is minimal light pollution and dry, thinner air in the mountains! 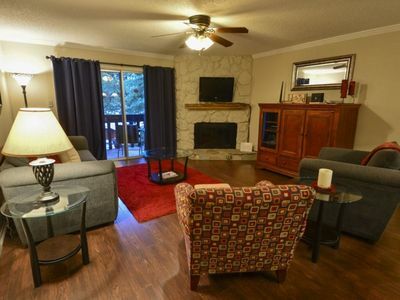 After dark you could also choose the use the outdoor fire pit! The fire pit is great for making S'mores, ghost story tellin' and memory making. 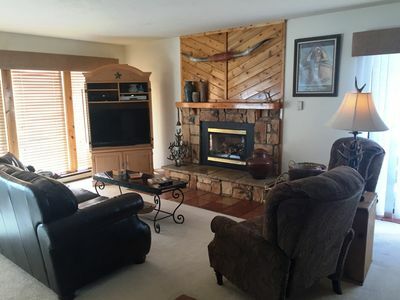 The great room features a vaulted ceiling and a stone fireplace with a gas log-lighter. 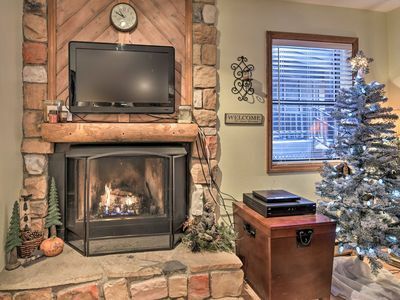 On each side of the fireplace are large, energy-efficient picture windows offering beautiful views of the surrounding mountains. 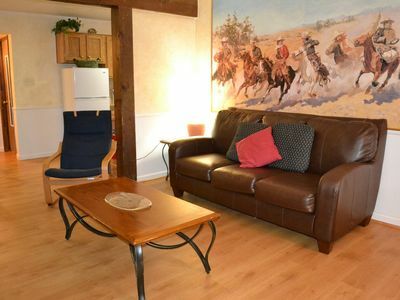 Comfortable updated couches and chairs make for great conversations and relaxing or playing games with friends. There are several built-in bookshelves that are stocked with books of various genres along with a desk for those that need a place to catch up on some work or email. 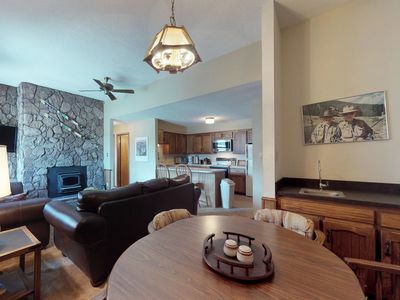 The home is equipped with 30mbs WiFi access throughout along with two TV's. 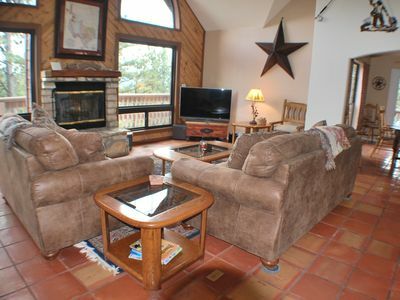 There is a 50' LED TV/DVD in the great room while the loft has a 21' TV with a PS2 game station/DVD player. If you enjoy cooking, you will love the spacious open kitchen, which features all major appliances including a gas range, dishwasher, microwave and refrigerator/freezer with ice maker. There are five stools at the kitchen bar where guests can sit around the kitchen chatting while a pot of New Mexico style chile (chili if you are not from New Mexico) simmers on the stove. We have left a delicious recipe for Green Chile in our recipe exchange book in the kitchen. The dining area is directly off the kitchen and seats 8 at the updated table. 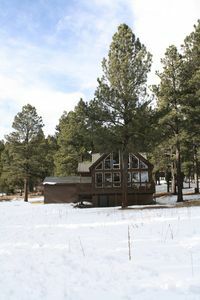 The dining room has outside views; while eating breakfast you may look out of the dining room window and see mule deer or other wildlife walking outside the home. In addition the hot tub on the deck there is a four-person, cedar lined dry sauna available in the home. 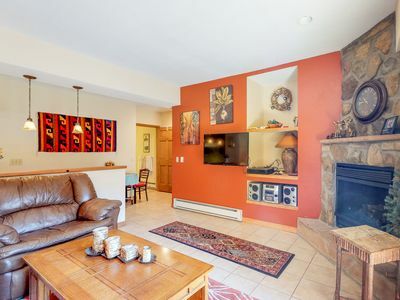 For our winter guests you will find the tiled entry to the home a convenient spot for removing snow covered winter clothes. 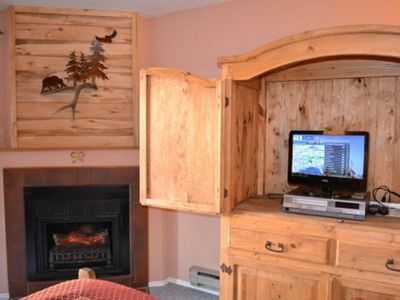 It has room for storing your skis, ski boots and ski clothes in a main closet. 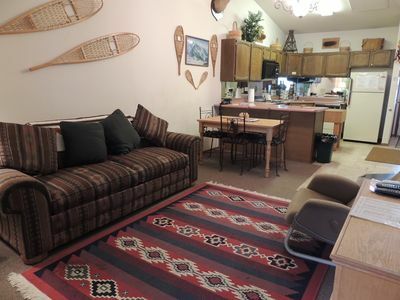 In addition, the full size washer/dryer is located just off the entry so putting wet ski clothes in the dryer is easy! 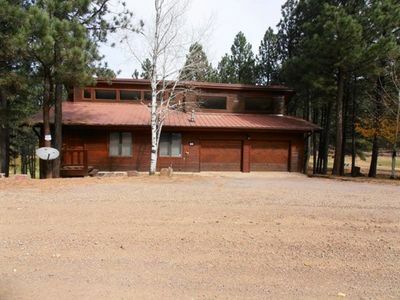 Allouette 9305 is a very convenient location for families of scouts or scouters attending Philmont Scout Ranch! 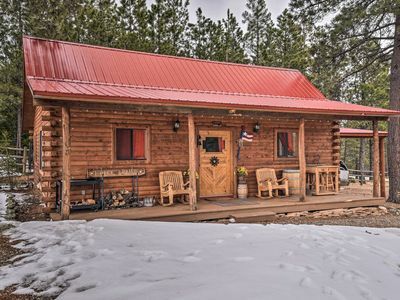 The home is about six miles as the crow flies from the southwest corner of the Philmont property and about a one hour fifteen minute ride to the main base camp area. You can also view pictures of activities at the 'Allouette 9305' Facebook page! 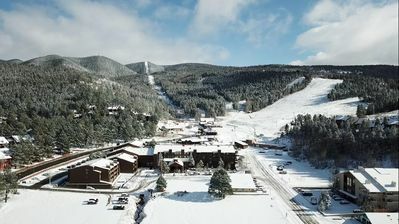 No matter what season you come to Angel Fire, we hope you enjoy your stay at Allouette 9305! NEW LISTING! 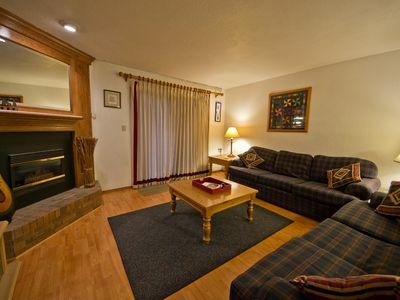 Homey condo w/ fireplace, flat screens, stereo & ski access! NEW! 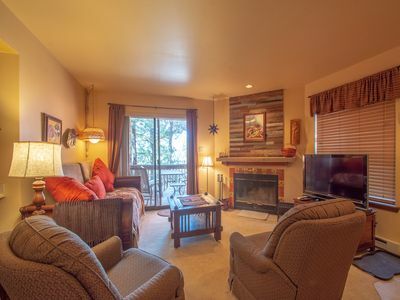 Cozy Condo - 1/2 Mile to Angel Fire Resort!